A new year brings a new start for me. My first time blogging and I am so excited. This blog will show the things that interest me and keep my fingers busy. I will be showing you all the books I enjoy reading and reviewing them. I hope to take part in quite a few challenges involving reading which I found on the Sunday Salon site. I will also be showing my scrap pages that also keep me occupied. I am planning to carry out the photo a day challenge that was listed in Scrapbook Inspirations. For this I have to take one photo a day for the whole year. I wonder if I will keep up. 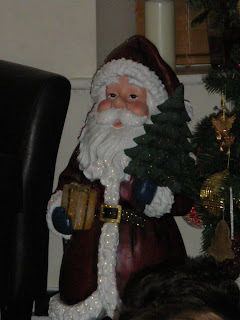 My first one is pictured above of one of my favourite Christmas ornaments - Father Christmas. Before he ventures back in his box, to be hidden away until next year. I do so hate taking the decorations down and I really feel they haven't been up that long this year. The house will seem very bare without them. Here is to a happy and prosperous New Year. Welcome 2009! That's fine - i seem to have plenty of time now Christmas is over. Just wanted to say thanks for the comment (on morning sickness) - I'm looking forward to following you on your new blogging experience - seems like just yesterday I was just starting mine! Thanks for joining the In Their Shoes challenge! I can't wait to read more posts on your blog. Good luck!